We've started back up with our schoolwork this week, along with millions of other kids around the country. Once more it's the usual round of math, science, history, geography, civics, literature, etc. But something interesting happened on Monday. Before breaking from school during the summer, we had been studying the Declaration of Independence, using as our guide the excellent book Self Evident Truth by Bruce Gordon. I was requiring the girls to memorize parts of this document, specifically everything except the list of usurpations of King George III. It's a big project to memorize such a piece, but I was encouraged by the thought that if generations of previous school children could do it, so could my girls. By the way, civics was never a subject I learned in public school in the 1970s. This was an area where I want my kids to be better educated than I was. It had been a few weeks since we'd done any schoolwork, so I half-expected the kids to have forgotten much of what they'd memorized. But I was wrong. Rather spontaneously they started reciting the first two paragraphs in tandem, alternating lines. When one would stop, the other would take over. It was quite nifty, really, and when they finally petered out and started laughing, I commented how if they actually memorized the whole Declaration (including the list of usurpations) and recited it in tandem as they just did, they could almost perform it at a talent competition. Half-jokingly, Younger Daughter mentioned that bribes might encourage them to accept this challenge. One thing led to another, Don agreed to the bribes, and suddenly our girls have a fine civics challenge: to memorize the entire document start to finish; to recite it in tandem while being videotaped; and to post that video here on the blog. The bribes in question? A complete ten-gallon fish tank for Younger Daughter; and two or three complete seasons of Star Trek: Deep Space Nine for Older Daughter. This challenge has galvanized the kids. Suddenly it's harder to get them to focus on science or geography because they're muttering the Declaration under their breath. "For a fish tank, I will do it," Younger Daughter commented. The deal is, they have to have this down cold by the end of November. I told them such a challenge would do more than just hone their memorization skills; it would also teach them elocution, an under-appreciated skill that is no longer taught in schools. 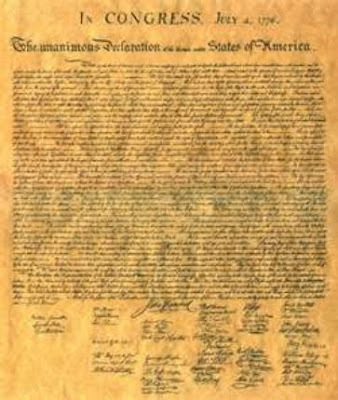 But most important, memorizing this immortal document means it can never be taken away from them. 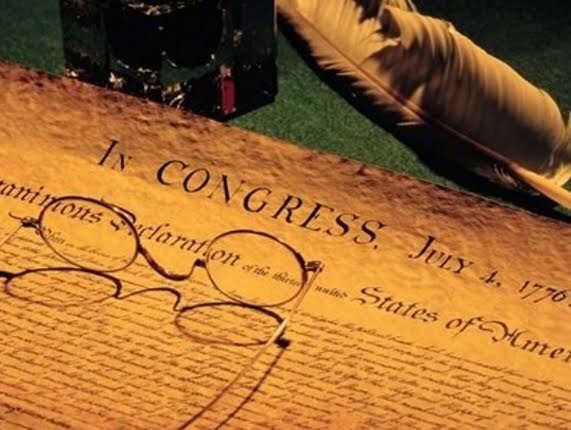 Our government can betray us all it wants; but our girls will always know how our country came to be as long as they understand the meaning of the Declaration of Independence. What a great challenge. I am proud of your girls (even though I don't know them), for taking up this awesome baton. I too went to school in the 70's and never learned civics. 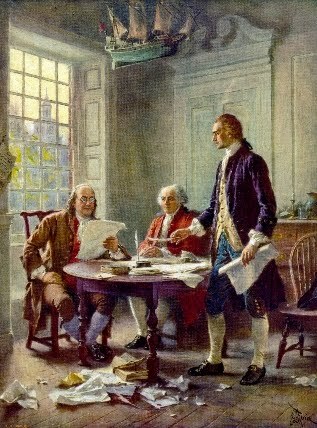 As a family we have been reading "The Heritage Guide to the Constitution" during our dinner meal. It is a great book to read. We are learning things that we NEVER learned in school. My daughters haven't memorized the Declaration of Independence, but they do memorize verses and chapters of the Bible to recite in church. Memorization is so much easier when you are younger (is what I keep telling them). I look forward to the video of your daughters. Great challenge and I'm sure they're up for it. I remember reading one of the Little House books and being surprised when I read a part with Laura saying "of course" she and her sisters knew the Declaration by heart. "Maybe I should take the memorization challenge..."
in public school years prior to my graduation in 1971, we had civics...did we ever! but the only memorization exercise we had was in the 8th grade...the gettysburg address. in the school system that i was enrolled in (arcadia valley missouri) civics was a very popular class to take..it was interesting, and helped prepare all of us students for living outside of our mountain communities. I didn't make my kids memorize it, but after reading in one of the Little House books, how the town read the Declaration of Independence at it's Independence Day celebration, we started reading it on that day as part of our family celebration as well. Your girls are great for taking the challenge, even if it is for bribes, LOL. Excellent endeavor! I pray for their success and can't wait to see the results. The sad part is the majority of police, civil servants, lawyers,judges and justices, will never know this by heart. Most of the people for whom it matters most will never bother to commit it to memory. Well this future History and Government teacher is impressed. If this goes well, I may challenge my future students to do it for extra credit. Did anyone notice how the list of usurpations of King George III are eerily very similar to the egregious list from our 'current administration'? Great job. Needs to be more of this type of thing. What a good idea. I think I'll steal it and have our family do the same thing. You're right, it can never be taken away. Great idea - our Western civilization study is currently in the way-back machine, and I'm anxious to get to American History. The Constitution will be great for recitation and copywork in the meantime. Working backwards from the whole is a fun mental exercise, anyway. What a terrific objective your girls have set for themselves! Way to GO, girls! You two are truly awesome. I know all of us readers will be waiting for the video and pictures of your prizes. Sweet! I think I'll take up the challenge with them. By November, huh? If any of you know what AWANA is, I tell ya, it was the best tool for memorization for kids and still as an adult I can memorize pretty well. When I have kids, memorization will be a big part of my homeschooling. The Gettysburg Address, The Midnight Ride of Paul Revere, The Declaration of Independence, all on the list! Good luck Girls!